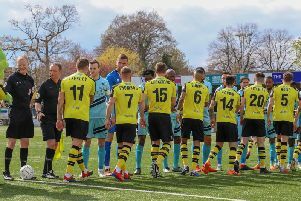 Harrogate Town manager Simon Weaver said he is relishing the prospect of Sutton United visiting the CNG Stadium on the opening day of the new season. The 2018/19 National League fixtures were released this week and the Wetherby Road outfit’s historic first ever game in the fifth tier of English football will pit them against one of last term’s strongest performers. The South London-based U’s finished in third place in 2017/18 but missed out on promotion after they were beaten by Boreham Wood in the play-off semi-finals. Like Town, Sutton play on a 3G pitch, and Weaver is expecting both a tough examination and a good game of football on August 4. “They’re a big club who have been doing very well in recent years and, of course, they also play on a 3G surface,” he said. “Because of that, and the way that they operate off the pitch, they’re a club that we have looked up to somewhat over the last couple of years. “They like to play football, and so do we, so it should be a good game and we know it’s going to be a tough test. With the likes of Leyton Orient and Chesterfield among their opponents this term, Weaver accepts that many will view his side as underdogs in the majority of their fixtures, but says that this perception will not impact on in his players in a negative fashion. “I’m sure that we will be seen as a small club by a lot of teams, but we’ll play with the freedom that that kind of thing affords you,” he added. “There are a number of ex-Football League sides and clubs with big fan bases, but we’ll enjoy the challenge of going up against them.